In Anatomy of a Scandal, a plodding pace and unsympathetic characters ruin a timely high-concept plot. Anatomy of a Scandal details what happens to supporting players when someone is accused of a sexual assault that may or may not be consensual. It is set in the British government. The book includes the point of view of the accused, the wife of the accused, the victim and the prosecutor. 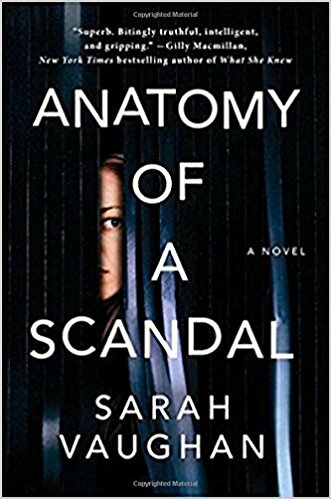 Released in the middle of the #metoo movement, Anatomy of a Scandal has an extremely timely plot. If this was a true story, it would be fascinating. However, it is fiction so a certain level of plot speed and movement is expected. The story moves s-l-o-w-l-y especially in the first half. Everyone revisits every decision in the smallest detail. The accused and his wife’s back story are agonizingly described in flashback chapters. Even though others are calling this a character driven novel, none of the characters are fully fleshed out or sympathetic. The accused is just a privileged jerk. The victim is young, drunk at times and naïve. The accused’s wife doesn’t want to lose her privileged life. The prosecutor is a workaholic witch. Everyone has secrets. There are several twists but they didn’t integrate well into the plot. The twist at the end was good but by that time this reviewer was already over this book. Anatomy of a Scandal is recommended only for those readers that like slow-burning reads. 3 stars. Thanks to the publisher, Atria/Emily Bestler, and NetGalley for an advanced copy.